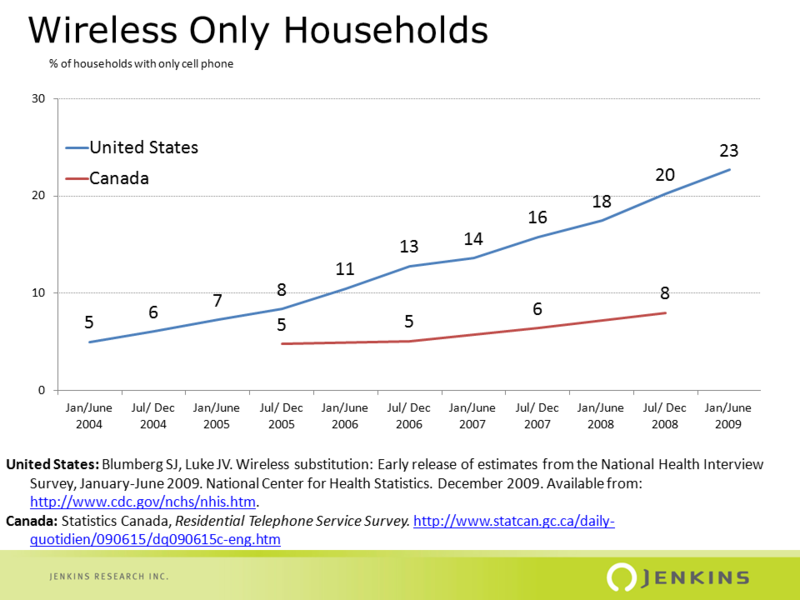 Wireless Substitution: Canada Falling Behind | Jenkins Research Inc.
Increasingly households in the United States are abandoning their landline phones in favour of the wireless phones which have become so ubiquitous. Last year the Centre for Disease Control found that 23 per cent of households had only a wireless or cell phone. Trend Canada data in Canada is not as complete but it shows a different picture. According to Statistics Canada, 8 per cent of households were cell phone only in December of 2008 (2009 numbers will be released this summer). At 8 per cent Canada is way back of the United States and the gap appears to be widening. Each year more and more Americans abandon their home phone and there is no evidence that the trend is likely to slow at any time soon. Canadians are also abandoning their home phones but not as quickly. What is driving the faster rate of abandonment in the US? The abandonment of home phones and the emergence of a wireless only household reflects the merging of several related trends. On the one hand, changes in household/ family composition, particularly the rise in single person households has undermined the idea and the need for the “family phone.” On the other hand, the emergence of an immediate gratification/ constant-contact attitude has made a fixed-line phone archaic compared with the freedom of wireless. Of course, there is little reason to believe that Canada has been exempt from these changes so these attitudes are unlikely to be the reason for the higher percentage of wireless only households in the U.S. The explanation for the gap is either wireless service quality is higher in the U.S., or, that it is more cost effective to go wireless in the United States. The latter seems more likely. Does it matter for Canada? The gap between Canada and the U.S. is indicative of Canada falling behind when it comes to the wireless world and more broadly innovation. Although many of us have cell phones in Canada, it is ultimately not just having them but what we do with them that matters. We can likely expect that people who have abandoned their landline are also more fully using the potential of a cell phone to be more than a phone. They have embraced cell phones as more than just a way to reach them when they are not at home or in the office. Of course, the consequences of the slow incorporation of new technologies and innovations in the business process as well as in the consumer market, is a lower level of individual productivity as well as fewer opportunities for companies offering cutting edge technologies. It is also true that more households that were going cell only would increase the pressure on landline/internet based phone companies to offer better services as lower prices. All of which would benefit consumers. Does it matter as a survey research professional? We have, as an industry in Canada, largely ignored the role that cell phone only households might play in telephone surveys. For a couple of exceptions, see the treatment of cell phones by Field Management Group of the MRIA and two relative recent presentation (Surveying Cell Phone-Only Canadians: Looking at the Possibilities and To Cell or not to Cell). It is time, however, to place considerable more effort at understanding what this means for Canadian market research and polling?